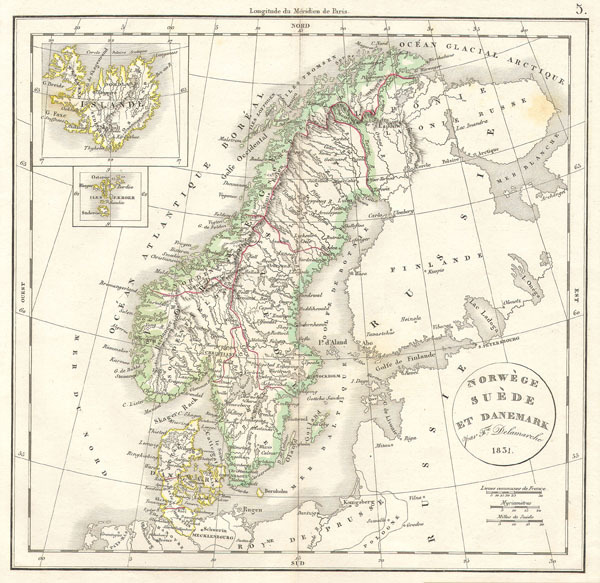 This is a fine example of the 1832 Delamarche map of Norway, Sweden and Denmark. Centered on the Kingdom of Sweden, it covers all of Scandinavia, from the Arctic Ocean to Denmark and from Norway to the Gulf of Bothnia. Two inset maps in the top left quadrant detail Iceland and the Faroe Islands. At this time in history Scandinavia was in the midst of a prolonged period of peace and prosperity that led to a cultural and population boom. Various cities, towns, rivers, lakes and other topographical details are marked. Issued as part of Delamarche's Atlas de la Geographie. Delamarche, F., Atlas de la Geographie Ancienne, du moyen age, et moderne, (Paris) 1832. Very good. Blank on verso. Original platemark visible. Original cernterfold exhibits typical wear.